Officially, the only way to force a monster into a scene is through an unexpected event result. That might seem too small a chance for a campaign where dangerous beasts ought to be more likely, such as a sci-fi story exploring new planets, or high fantasy that features large underground complexes populated with oversized fire-breathing reptiles. What about the cool monsters? There’s a simple answer: In Chapter 7 on encounter scenes, there’s the point that: “The player then rolls randomly or selects results that make sense (from the foes table)…” if monsters are potential foes in the setting, the player can select them as part of a foe scene. Mix and match if you’d like. Keep in mind, too, that conventional foe results can be non-human. Mindless minions might be giant insects or the undead; hybrids/animals and vehicles/mounts could include creatures like giant rats, wolves and eagles, or riding lizards. “Automaton” might be anything big & mindless; it could include plant-based creatures, jellies, jams, puddings, oozes and so forth. In a recent heroic-level game I’d been playing with street-level supers, big groups of conventional foes weren’t quite cutting it. It was also a pain to generate large groups of foes for encounter scenes. The simple answer was to roll up some supervillains as if they were monsters. Their monstrous conflict and damage levels, plus special abilities, gave the heroes a serious challenge. The potential downside is that it’s always possible to want a smaller beast but end up rolling a cosmic-level threat. Them’s the breaks; at that point the player will probably want to swap the encounter scene for an encounter scene, or just reconsider how the player character’s group can extricate itself and get away from the threat without taking major casualties. One of the important things a player needs to do in Libre Solo Role Playing is to ask why, whether that’s to ask yes-no questions, or to fill in the blanks with window dressing. If the protagonist was going to meet her/his patron at a cafe, and instead the scene quality indicates the scene takes place at a factory, there’s a reason for that change in plans. Why is the scene happening at a factory? There must be some significance. Get curious and think up what’s going on here. Is the factory new and sleek? Older and outdated? Abandoned or in ruins? Is the meeting taking place during working hours, or after hours? What is, or was, manufactured in this place? That could be a random (d100) item roll. All these questions, whether they’re asked as formal yes-no questions or just something for the player to think about, can be significant to infer more about what the conversation is going to be about. The patron might be there to introduce a randomly rolled (d100) person as a third party who is relevant to the plot. If you do roll and get an unusual result (let’s say “religious lay folk”), you’ll have to sort out how it all comes together. One possible answer is that the “factory” is a working monastery. Another possibility is that the factory assembles goods used for religious purposes. That may be re-printing a version of the good book. Or it could seem to be a bustling factory on its surface, hiding unsavory and sinister activity underneath. The point is always to think about the details based on any random roll results Libre Solo Role Playing gives you for a scene. That could be scene qualities (including places and rationales), persons or items, or unexpected events. Why X and not Y? That leads to asking interesting yes-no questions that fill out a scene with plenty of detail, that can in turn be important and relevant to creating a richer story. It might seem like Libre Solo Role Playing is really complicated. There are 50 pages of GM Engine rules; another 35 pages of RPG ruleset plus optional rules; and another 30 pages of appendices and other summary tables to wade through. It can definitely look overwhelming. The core game is straightforward and simple; you can strip it down into a number of inter-related parts. You get a goal (called a mission) for your player’s character, and try to resolve that mission through a series of scenes that collectively tell a story. You get closer to your goal by achieving “meaningful success” in scenes. Get enough meaningful successes, and you ‘win’ a positive outcome to the story. That might mean wealth, experience or prestige. If you can’t get those successes, quit the story and face a bad ending. Build each scene by imagining where you want the scene to be and what you want it to look like. Then roll three random scene qualities. Adjust your expectations to those scene quality rolls as much as you can. You can roll randomly or choose a key person of interest and/or a key item to be present on the scene. These people, objects and descriptors are “hints” about what’s important in the scene that you can use. Write in the details of what you want the scene to look like as window dressing. This can help you later. If you’re playing a cutscene, the scene will be about a dialog with another person. Cutscenes don’t get you closer to your goal, but they get or change your mission goal(s), and let you request resources and assistance. If you’re playing an obstacle scene, for meaningful success you need two things: Come up with three different, moderately difficult skill checks where your player’s character succeeds (with or without help); and “ask for trouble” at least three times. Succeed at those two things and the plot moves forward. But — every skill check failure has a consequence. When you fail a check, something goes wrong. Every time you ask for trouble, it risks trouble happening. That can also mean a threat or setback. If you’re playing an encounter scene, you build a randomly generated foe group and then try to beat it in a conflict. Sounds simple, but it means resorting to skill checks more than ever to gain advantages, because those who live by the sword… Win the conflict and the plot moves forward. The player can throw in the towel when scenes just aren’t moving forward, but that can mean dealing with the repercussions in an immediate follow-up scene. Use the yes-no question tool to add or clarify details that are uncertain in a scene, and to ask for trouble. Use skill checks to see whether an attempted action succeeds or fails. There’s plot stress, in the form of a counter that increments every time there’s a yes-no question or skill check. Every so often, a roll will spit out an unexpected event that the player may need to deal with. That’s the game in a nutshell! Much of the rules are about adding structures, with examples and guidelines to the basic game’s framework. What should a dialog look like, and what can a player request? There are structured questions that tell you. How does one uncover secret or hidden things if the player is also the GM? There’s a technique for exposing the unknown. What about handling adventuring parties? There’s a section about patrons, allies and rivals, as well as advice about foe groups. You can flip encounter scenes into obstacle scenes and vice versa. Large-scale battles? Mixing melee and ranged combat? Dealing with special powers? Advancing the player’s character, ally and rival experience? The RPG ruleset has all that covered, but bring in your own RPG ruleset if you’d like. I need to give a huge thanks to artist and graphic designer Doug Chapel. He’s the featured artist whose work illustrates Libre Solo Role Playing. It’s not a conventional RPG, and Doug isn’t a conventional fantasy/science fiction artist. Much of Doug’s artwork consists of fevered visions that puts pop culture in a blender, merging action figures and anime, comic books and magic cards, crumbling urban decay and sprawling futuristic cityscapes — all in a signature style that he’s been honing since the 1980s. Really, check it out. Can Libre Solo Role Playing handle horror? Libre SRP was built for action and adventure. That could be gritty and dangerous, high-flying heroics or two-fisted pulp mystery. It was all about getting the protagonist on the case for a mission, looking to achieve a goal without being thwarted. So the question of will Libre Solo Role Playing handle horror, was sort of like asking the meme, will it blend? It could always be done in theory. The Libre SRP book (p.36) had some horror themed examples that mix asking for trouble with the practice of exposing the unknown: The shock reveal of a hidden threat, and uncovering the horrible truth. It was mostly theory. So I sat down and put the GM Engine through its paces with two frightening tales. The verdict: It delivers! My protagonist, Daniel Severyn moved into a brooding old Victorian in rural upstate New Hampshire, an isolated place next to an ancient graveyard. The town’s church minister had recently disappeared. Throughout the story, Daniel kept requesting, and the police kept giving lip service but never dispatched an officer; the closest next-door neighbor was an odd duck who called herself “Cousin Jane”, who kept sniffing around the place looking for stuff to take. The supernatural turned out to be the least of Daniel Severyn’s problems — he ended up drawn into the graveyard at night after seeing some mysterious lights and noises — and bore witness to an unspeakable cultist ritual. After that, Daniel was in over his head. The protagonist survived the first story only because he got smart and ran for his life, piled into his car and never stopped driving until he was back over the Massachusetts border. It worked — the only weak spot in the first story was that I’d been unclear on Daniel’s objectives (what Libre SRP calls a mission). The game benefits from a motivated protagonist who pushes the action forward. Daniel Severyn was a reluctant protagonist tripping into dangers instead of driving the plot in the first story. Part 2 righted that error. Danny was hired by tycoon Jasper Saltonstall to head right back up to the same old Victorian house in rural New Hampshire, backed by a team of professional ghost hunters called J&J Paranormal. Because of cultist interference they never made it to the house. Most of the J&J team ended up in the hospital. They quit on the spot. That meant Daniel Severyn had to go back cap in hand to Jasper, who arranged his personal lawyer, a professional bodyguard and an ex-cultist, and set them up with a bulletproof SUV. That group got to the house without trouble, but after that got dicey. The cultists managed to convince the lawyer it would be in his best interests to leave quietly; they sabotaged Daniel’s car; then they cut the power to the house as the sun went down… but the protagonist’s group survived the night. From one of the cultists they retrieved clues of the cult’s activities worldwide. Their stronghold in New Hampshire was just one of a series of global nexus points. Jasper Saltonstall was extremely pleased, and can’t wait to sponsor Danny to get on the road and investigate further. I’m torn whether I’ll risk Danny a third time by continuing the story. In two stories he’s already had several close calls. So, horror? Yes, Libre Solo Role Playing does horror – quite well, in fact. Why does Libre SRP exist? In early 2017, I’d already been tinkering with Libre Solo Role Playing for a while, and word about the manuscript came up in the gaming group. A wise gamer asked this question: “what’s in it for the player?” His point: In D&D, for example, there’s a subtext to the game that players kill monsters and take their stuff, gain experience and become more powerful, to kill bigger monsters and take their stuff… and so on. Some RPGs are just simulators that don’t have obvious progression or inherent victory conditions. So, to answer “what’s in it for the player?” There are a couple reasons Libre SRP exists. One of them is that lots of us gamers have dozens of systems or settings that we personally love. Many of them rarely see face-time in a game group. Don’t get me wrong, in-game face time is the best! But it takes a lot of coordinating in real life to get people together, and session with some problem-solving and an encounter or two takes three or four hours of play. Another reason why Libre SRP exists is that group gaming means group compromise. One player lives for combat encounters, someone else loves a good story, a third is there for the morality play, a fourth wants loot and glory. Most anyone who’s played RPGs has heard about the Leeroy Jenkins effect. Somebody insists the group should talk to the galactic emperor’s emissary; negotiations get broken off when another player character decides s/he’s bored and lights up everybody with a plasma cannon. 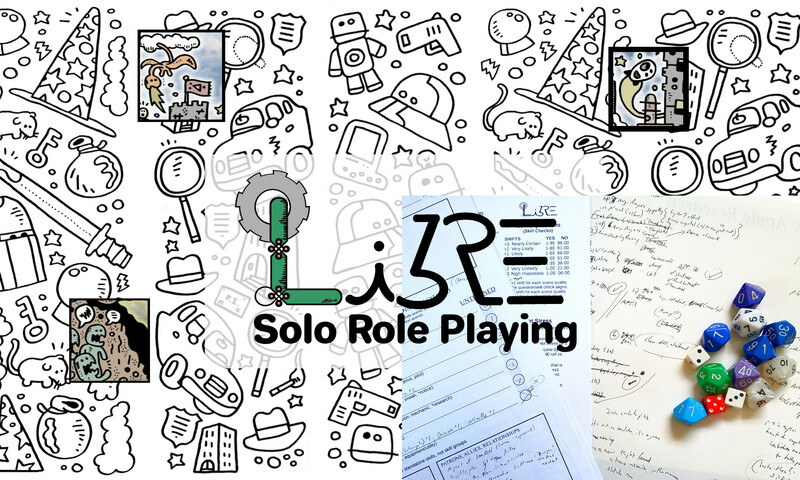 Libre Solo Role Playing lets you tell the stories you want, in your way. One key to the game: You can immerse yourself in character and setting. If you want a story with mystery and intrigue, or want a story with action and adventure, or want a story that focuses on interpersonal relationships, you lay out the challenges and aim to overcome them. What’s more, you can play (and tell) a short story from start to finish in as little as an hour, sometimes much less — all you need are dice, pencil and paper, printouts of the action and mission sheets, a block of uninterrupted time and a quiet place to concentrate. Let the world challenge your character with obstacles to overcome, plot twists, setbacks and surprises. There are many GM emulators out there. Pretty much all of them have the same flaw, which I’ll describe as laying tracks in front of the train while it’s running. Another way to put it is that other GM emulators are stateless. They don’t take into account what’s happening in a scene, good or bad, or where that leaves the protagonist. This leads to another key to Libre Solo Role Playing. Your protagonist has an overall story goal, and your challenges and resources are structured. Each scene, the player sets scene goals to move the story closer to resolution. To stretch the train analogy, in Libre SRP the player’s plan will go off the rails: but the train tracks are still there, and the next station is still visible in the distance. A large part of the game is about taking risks and recovering gracefully from consequences, setbacks and blowback. Another big missing piece from GM emulators is that they don’t touch game atmosphere. Solo RPG enthusiasts sometimes end up bolting on window dressing manually, though it’s possible to get buried under an endless sea of random tables (sadly, Tim Ballew’s awesome DungeonWords and WilderWords pocketmods seem to have disappeared from the Internet). Libre SRP’s answer: Make atmosphere – in the form of people, items, descriptors, places and atmosphere – a key part of the game. Put bonuses on players’ ability to engage with key scenery, their use of equipment and ability to leverage NPC personalities. Use all the elements in a scene in creative ways, both to generate skill challenges and to resolve them. Again, “what’s in it for the player?” Well, you can build a character and select a setting; import a ruleset of your choice if you want. Put your character through his/her paces, beat them up and see if you can win. Succeed or fail, you’ll tell an interesting story along the way. Interacting with scene details is vital to success. Build networks of NPC relationships over time that make each successive story that reprises the same player character potentially deeper and more meaningful. Build up your characters’ experience over time. It’s all that. But most of all it’s about telling the stories you want, in your way. Random powers appendix is done.